A six-day workshop for education professionals that will transform their understanding of themselves and their students. Price: $2,400, which includes tuition, lodging, most meals, and materials. Limited partial scholarships are available. What Is the Greater Good Summer Institute for Educators? A quantum shift in how we educate our children is taking place in schools all over the world. Academic knowledge alone is no longer sufficient in helping students to cultivate happy, productive, and meaningful lives, and to make a positive contribution to their communities and the world. Indeed, a 2014 study found that emotional health and prosocial (kind and helpful) behavior in childhood had greater long-term impact on adult well-being than academic success. In addition, the rapidly growing body of research on social-emotional learning, mindfulness, ethical development, mindsets, identity, purpose, and other non-academic topics – or what we here at the Greater Good Science Center call the “Science of Prosocial Human Development and Education” – is deepening our understanding of the learning process and, at the same time, challenging our beliefs about what exactly we are educating for. Schools are beginning to address this gap in student development by adopting social-emotional learning, mindfulness, character education, and other non-academic programs. Yet, to be truly impactful, the precepts of these programs need to be integrated in developmentally and culturally appropriate ways into all areas of education, such as school and classroom climate, teacher-student relationships, adult relationships and well-being, content, and pedagogy. The Greater Good Science Center’s Summer Institute for Educators provides education professionals from all over the world the opportunity to expand their knowledge of the science of prosocial human development and, most importantly, to learn how the practical application of this science can be used to help them build classrooms and schools where both the students and adults thrive and where education becomes about more than just test scores and future job skills. In addition to listening to brief lectures and learning practical applications of the science, participants will engage in deep self-reflection, thought-provoking discussions, and collaborative strategy sessions as they consider how this science applies to the various aspects of education mentioned above. They will also have the opportunity to informally share with each other what they are already doing to create thriving classrooms and schools. In order to form a strong support network – one that will last long after the Institute is over – participants will be divided by job category into “families” of eight to ten who learn, explore, and play together throughout the six days. Participants will also have plenty of opportunities to connect with other educators outside their families. Ultimately, participants will leave empowered with cutting-edge, science-based, culturally relevant, and developmentally appropriate strategies, tools, and processes to implement these important aspects of student and adult development in their school environments. Understand how the integration of social-emotional learning, mindfulness, and character education creates a comprehensive and holistic blueprint for the social, emotional, and ethical development of both students and adults. Understand and practice how to view education through the lens of “prosocial human development", including social-emotional learning, mindfulness, identity, purpose, mindset, and ethical development. Examine and understand how our beliefs about social, emotional, and ethical development affect our work with students and as education professionals, in general. Learn and create culturally and developmentally appropriate, research-based tools, strategies, and processes for integrating the science of prosocial human development into many areas of education, including the teacher-student relationship, student and adult well-being, school and classroom climate, content, and pedagogy. Develop strategies for sharing this work with others back home. Pre-K through university-level educators, counselors, psychologists, school and district-level administrators, and pre-service teacher and administrator educators who are interested in cultivating the prosocial development and well-being of students and the adults who work with them. Please note that our application process has changed from previous years. To apply, please click on the “Application” tab and complete the online form. Applications will be considered on a rolling basis and applicants will be notified of their status within approximately two weeks from the time of submission. The application deadline is February 1st, 2017. However, once a session is full, applications received henceforth will automatically be added to the wait list. Apply early to ensure consideration for a spot at one of the 2017 sessions. Payment will be due in full one month after acceptance to the institute. Groups of three or more from the same school and/or district will receive a 10% discount per person. We understand that many local participants might prefer to sleep at home during the Institute. However, those from nearby communities during past Institutes stated repeatedly how grateful they were for the opportunity to leave behind the daily stressors of life. Time away from home allowed them to fully engage in the learning community and to reflect more deeply upon the material. Therefore, we are requesting that all participants stay on campus. Housing accommodations are located at the University of California, Berkeley, Clark Kerr Campus--a beautiful Spanish-style complex, highlighted by terra cotta accents, tiled fountains, and landscaped courtyards. Situated in a lovely Berkeley neighborhood, the campus is within walking distance of restaurants, shops, and the UC Berkeley main campus. For outdoor enthusiasts, there are several hiking trails with breathtaking views of the San Francisco Bay directly behind the campus. The two- and three-bedroom suites have attractive living rooms and one or two bathrooms that are shared by suite occupants. Each participant will be assigned a private room with a shared bath. Participants will dine in the Great Hall Dining Room with its richly paneled walls and coffered ceiling. Buffet menus offer a wide selection of hot entrees (including vegetarian and vegan options), a 100% organic salad bar, vegetables, soup, beverages, and desserts at each meal. Breakfast and lunch are included, beginning with breakfast on Monday and ending with lunch on Friday. Coffee, tea, and snacks will be available during the meeting sessions. You will have the option of purchasing dinner at the Dining Hall or making your own evening meal arrangements in Berkeley (or the greater Bay Area). Participants are required to arrange their own travel arrangements. Please do not make any arrangements until you are admitted to the program. More details will be included in the registration package. Parking permits are available for $80/session. $2,400 per participant. This includes tuition, materials, room, and board (breakfast and lunch included). Participants are responsible for their own travel expenses and arrangements. Understanding that those who attend the Summer Institute for Educators do so on the salary of education or non-profit professionals, we do our best to make the Institute affordable without sacrificing quality or integrity. If you are unable to pay the full amount, we ask that you first check with your school/organization to see if they will cover any of your costs with professional development or other funding. If your school does not have funding, or their funding does not cover what you need, we may be able to provide a partial scholarship to help offset the cost of attendance. The Greater Good Science Center is completely funded by donations and grants -- we do not receive any financial support from the University of California, Berkeley. As such, we have limited funds available for scholarships and cannot offer full scholarships. In order to be as fair as possible to all applicants and create the most opportunity we can with the scholarships, we ask applicants to request the minimum necessary. Please note that UC Berkeley policy prohibits us from awarding scholarships for travel. A limited number of partial scholarships will be awarded. To apply for a scholarship, please fill out the scholarship section on the application. Cancellations must be submitted via fax or email. Full refunds will be given up to 45 days prior to the start of the program. Due to program demand and pre-institute preparations, cancellations received 44-31 days prior to the start of the program are subject to a fee of 10% of the program tuition. Cancellations received within 30 days prior to the start of the program and no-shows are subject to the full program tuition. Please note: cancellation fees are based upon the date the written request is received. In her role as education director, Vicki writes a blog that provides science-based ideas for promoting the social and emotional well-being of students, teachers, and administrators, as well as methods for creating positive school cultures. Her work has also appeared in ASCD’s Educational Leadership,Edutopia, and Huffington Post. Vicki also gives talks and workshops, and leads the GGSC’s Summer Institute for Educators—an annual multi-day event in which educators from around the world learn how the science of compassion, empathy, gratitude, awe, and other social-emotional skills can enhance their own lives and the lives of their students. In addition to her writing and workshops, Vicki consults with organizations on how to incorporate the science of well-being into their work. Recent collaborations include those with the Mind and Life Institute (of which she is a fellow), the Jim Henson Company on a new television show for preschoolers, the International School of Brussels on the Common Ground Collaborative curriculum, and Pixar/Disney on The Emotions Survival Guide—a follow-up book for children based on the movie Inside Out. Amy L. Eva, Ph.D., is the education content specialist at the Greater Good Science Center. She writes for the GGSC’s online magazine, teaches at the Summer Institute for Educators, and consults on the development of a new GGSC toolkit for educators. With over 23 years in classrooms, she is a teacher at heart. She is fascinated by neuroscience, the psychology of learning, and adolescent development and has spent the last 12 years as a teacher educator. As a researcher, she has published in the areas of teacher education, metacognition, adolescent mental health, social emotional learning, and mindfulness-based interventions with marginalized youth. Her most recent publication “The Mindful Teacher: Translating Research into Daily Well-being” (The Clearing House), describes mindfulness, provides research-based evidence of its usefulness, and highlights resources that educators can use to manage stress and improve their well-being. Amy received her doctorate in educational psychology from the University of Washington where she studied the interplay between thoughts and feelings as readers respond to poetry. In the creative realm, she has led a poetry reading group called “Monday Morning Musings” and has contributed to a book featuring poems that inspire educators (Teaching with Fire: Poetry That Sustains the Courage to Teach. Amy lives with her husband Tim, three kids, and three cats in Seattle. She conducts workshops on teacher resilience and provides resources for educators on her blog (www.amyleva.com). Dante D. Dixson, Ph.D., is currently an Assistant Professor at Wayne State University in the Educational Psychology Department. Dr. Dixson graduated in 2016 from the School Psychology Program at the University of California, Berkeley; he also has a Bachelor’s degree (Honors) in psychology and a Master’s degree in education from UC Berkeley and is certified for the practice of psychology in schools. The author or co/author of nine scholarly pieces, his research interests include disadvantaged youth, gifted education, and the role of hope in the educational and psychological functioning of children and adolescents. Dr. Dixson served for three years as Managing Editor for the Review of Educational Research, and he is a recipient of the Cota Robles Fellowship (from UC Berkeley) and an African American Success Foundation Research Grant. He is a member of several professional associations, including the American Educational Research Association, the American Psychological Association, and the Association for Psychological Science. Dr. Dixson also serves on the Board for the SmARTminds Youth Leadership Program. Frederic Luskin, Ph.D., founded and currently serves as Director of the Stanford University Forgiveness Projects. He is also Senior Consultant in Health Promotion at the Stanford University Health Center and Department Chair in Clinical Psychology at Sofia University. At Stanford Dr. Luskin teaches classes on The Art of Happiness, Meditation, Developing Emotional Intelligence and The Psychology of Storytelling to undergraduate and graduate students. He also conducts numerous workshops and staff development trainings in his work for the Stanford Be Well wellness program. Dr. Luskin’s forgiveness work has been applied in veteran’s hospitals, churches, in resolving legal disputes, with cancer patients as psycho education and in psychotherapy. He has helped people recover from the murder of their family members as a result of political violence in Northern Ireland, as an aftermath of the attacks on 911, in Sierra Leone after their civil war and in artic Canada where native populations deal with the loss of their ancestral lands. Mary Hurley is the Coordinator for Social and Emotional Learning and Leadership in Oakland Unified School District (OUSD). Mary was a classroom teacher for 30 years prior to coordinating a district partnership with the Bay Area Writing Project (BAWP) and serving as an OUSD Leadership Coach. She is a Carnegie Fellow, a BAWP Teacher Consultant, and is on the Mills College Teacher Scholars Advisory Board and the Advisory Committee for the CASEL Collaborating States Initiative. Josh Bloom is the Teacher on Special Assignment for Wellness and Social-Emotional Learning at Palo Alto High School in Palo Alto, California. He has worked as a member of the school’s Wellness Leadership team to examine and address the systemic, cultural, and personal work required to increase the mental health and well-being of students, staff, and the broader school community. This year, Josh has served on a district-level committee charged with recommending a framework, standards, learning targets, curricula, and implementation plan for developing the social and emotional competencies of all Palo Alto Unified students pre-K through 12th grade. In particular, his work on the committee has focused on researching and vetting existing SEL frameworks and implementation strategies and determining how best to adapt, integrate, and innovate existing work to fit the unique needs and culture of the Palo Alto learning community. Prior to his current role, Josh served as a department instructional supervisor, and continues to serve as a teacher advisor in Paly’s advisory program. Now in his 16th year as a high school physics and astronomy teacher, he continues to educate with the philosophy that all content in all subjects can serve as a context through which the deeper lessons of life can be explored, cultivated, and appreciated if we can first find this meaning for ourselves. Amy Honigman, Ph.D. has been a clinical psychologist for nearly 35 years. She holds a BA in Psychology from U.C. Berkeley, a MS in Counseling and a Ph.D. in Clinical Psychology. Her extensive professional experience includes working at San Francisco General Hospital, the Veteran's Administration, a department head of Neuropsychology in a rehabilitation hospital, mental health consultant to the Thiel Foundation's 20 Under 20, and is currently at U.C. Berkeley's Counseling and Psychological Services. She also maintains a private practice in Oakland CA, focusing on high achieving teens and young adults in helping them find the right balance between academic demands and wellness. After studying with the Institute for Meditation and Psychotherapy, Dr. Honigman expanded her work to include mindfulness practices that enhance therapy and address social-emotional needs. She has trained with Mindful Schools as well as with Jon Kabat-Zinn to become a teacher of Mindfulness-Based Stress Reduction (MBSR). In addition Dr. Honigman has become a teacher for Mindful Self Compassion (MSC), created by Chris Germer and Kristin Neff as well as Making Friends with Yourself, a adolescent version of MSC. Dr. Honigman has written curriculum for Anti-Bully and Promoting Respect programs for middle and high school programs. In addition she has been a strong advocate for enhancing student wellness at U.C. Berkeley and has been actively involved in teaching students MBSR and Mindful Self Compassion. Last summer, she taught Mindfulness and Compassion in Therapy at Ocean University and Shanghai Jiao Tong University, both in China. In her free time, Amy supports agencies who promote social-emotional learning and mindfulness by helping with fundraising. She was actively involved in helping produce of the first fundraisers for the GGSC as well as an event for Mindful Schools featuring Jon Kabat-Zinn at Zellerbach Hall. I live in the Bay Area. Can I commute to the institute and sleep at home? We understand that many local participants might prefer to sleep at home during the Institute. However, those from nearby communities who attended the Institute in the past stated repeatedly how grateful they were for the opportunity to leave behind the daily stressors of life. Time away from home allowed them to fully engage in the learning community and to reflect more deeply upon the material. Therefore, we are requesting that all participants stay on campus. Do you offer CEUs for this course? Unfortunately, we are unable to offer CEUs at this time. Do I need to bring my own sheets and/or towels? No, UC Berkeley provides both these items. Can my spouse/partner stay with me in the dorms? Yes, but you must provide your own accommodations. We are unable to arrange for additional housing on either end of the institutes. Will we have free time to explore Berkeley and San Francisco? Yes, besides the first evening of the institute, you will have all evenings free to explore the Bay Area. "The institute was the best I have ever attended. The leadership and conference design have been impeccable. You guys are so attuned to the needs and predilections of teachers." "I have never been to a conference where educators were treated with such respect and professionalism and compassion." "Hard to imagine a more meaningful, impactful professional development experience as an educator." "It is so common for many conferences, workshops, seminars to be based in the cognitive dissemination of information and practices, but SIE really succeeded at underscoring the embodiment of this work and the importance of experiencing it for ourselves first before we bring it back to students and colleagues. I also love the connection that was made to the big questions, and the importance of surfacing our deepest beliefs if we are to change school culture and climate." "Armed with some powerful tools, I am returning to the teachers, mentors, and administrators I work with more passionate than ever about SEL. Determined to make changes in my organization, I now feel I have the resources and collective community to do this effectively. This has been an honor and I know the experience will have a ripple-effect in my field." 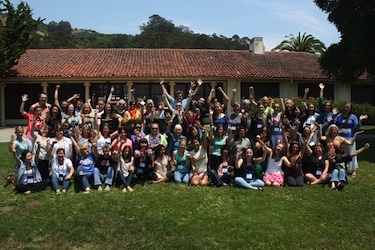 "Attending the Institute both helped me to be deeply grateful for the things my school already does, and to imagine and envision the places we can go in promoting SEL, mindfulness, and character education. Working with students of backgrounds historically underrepresented in higher education, these areas are so essential and so often neglected or ignored. It will be so special to bring back to share with my team and students." "Inspired, heart is full, mind is blown with new insights/resources/information. Heart is overflowing with gratitude for all of the connections and collaboration, the sense that we are now truly a part of something greater than ourselves. I had no idea how rich and fulfilling this experience would be. While I can't wait to enjoy the remainder of summer break, I truly can't wait to get back to work to put my ideas and inspiration into action." "I highly recommend the SIE the everyone and anyone involved in education, from infancy to adults. They encourage educators to walk the talk as human beings in order to guide others in doing it as well. What an engaging, awe-filled, emotional and inspirational way to spend the week!" "I am extremely grateful that the GGSC exists. I benefit from the articles regularly and the Summer Institute for Educators has been an absolute dream come true." "This conference has raised my level of consciousness to understand that by developing one's self, one creates opportunities to lift the lives of others. By learning to value and love one's self, one has an opportunity to create a world for the greater good." For more information, please email ggsceducation@berkeley.edu or call 510-642-2451.